McKesson Plain Packing Strips are a sterile dressing designed for nasal packing, dental packing, or as packing for open or infected wounds. The easy dispensing package helps facilitate caregiver convenience. 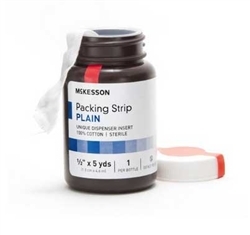 McKesson Packing Strips are a 100% cotton ravel-resistant gauze designed to resist linting or fraying.